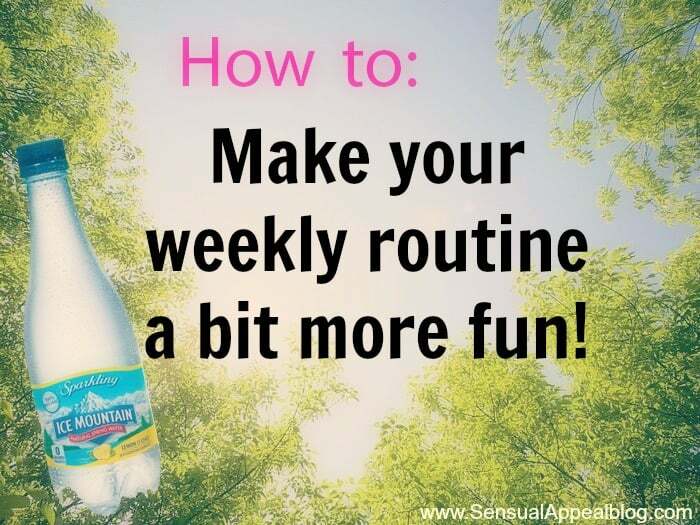 Make your weekly routine a bit more fun! This post is not to be confused with the post ‘how to add more fun to your workout‘ = which I discussed a week ago 😉 If you are interested in adding some fun to your workout, do check out the other post once you’re done reading this one! Ahhh… It’s back to school season. It’s the time where kids (or you) go back to school and things get back into routine-mode. We are getting back on track with goals, if we kind of let them fall to the wayside during summer. For many of us, the routine is great – I personally enjoy having a routine, it keeps things easy and predictable. However, there are cons to it, for example, things can get BORING. Can I get an Amen? Routine gets way BORING after a while. That’s the whole thing. No matter how well it might be working, we will eventually start doing things on auto mode and not putting ourselves as much into it anymore. That’s why it’s a good idea to add some extra fun to your week whenever your feel the slump coming up. 1. Take a new route. As we fall into our comfortable routine, we tend to get into the automatic mode where we no longer think about the little things such as which way to get to our destination. Therefore many times, we end up not even really being present when we are in the process of getting there. Like when you’re driving a car and you get to your destination and you don’t even remember driving or seeing anything on the way there? Yeah, you were in auto mode. You totally spaced out because you are so familiar with that route! So why not think of another way to get to your destination? Leave a little early and take a new route, a scenic route perhaps. This will keep you on your toes a little bit more and definitely make your day less boring. At least by a little bit. I don’t mean champagne, silly goose! I am a person who never drinks soda (duh, it’s terrible for you – if you are drinking it, I recommend you to stop) and my favorite drink is… water. Seriously. I am a water monster. I drink so much water it’s ridiculous. I also drink a lot of tea. My parents swear by this little tweak to make their water drinking experience that much better – they started drinking more sparkling water! Add some bubbly water to your life – Ice Mountain® Brand Sparkling Natural Spring Water has a ton of flavors and the only ingredients are spring water, natural fruit essence, and bubbles. This makes for a fun bubbly drink that will spice up your daily water-drinking routine into a fun and flavorful one. Who needs soda?! 3. Put a fun event on your schedule. This one is my favorite. There’s nothing that makes a boring weekly routine more fun than DOING fun things! Add some happy moments to your week by going to a brand new fitness class in the morning or after work or even during your lunch time! Or go on a movie date, alone or with friends, in the middle of the week. Who says you can’t enjoy your week just as much as if it were a weekend? 4. Impromptu ‘feel good’ moments. I know this is a pretty arbitrary one but I think it’s important that you add some pampering in to your weekly routine as well. Make them spontaneous. Do you feel tense in the middle of the week? Well, schedule an impromptu massage! See your nails starting to chip? Go to a nail salon during lunch and get a mani/pedi with some reflexology to go with it. Add fun spontaneous moments of bliss to your week and I guarantee your week will no longer feel boring! Every hump day you can share and get your own feel good moment! Ice Mountain® is sharing some of their favorite ways to feel good and escape the midweek hump. Check them out on their Facebook page! How do YOU get out of a boring weekday slump? This post is sponsored by Ice Mountain® Brand Sparkling Natural Spring Water. Great tips! Like to take different routes as often as I can. And I am ALL about impromptu feel good moments. We all need fun and surprises. I wanted to try out a new kind of “bubbly fruit water” I saw advertised. Actually I think it is called Fruit Water. But it has sucralose in it, which is some sort of artificial sweetener, and I can’t drink anything with artificial sweetener because it gives me headaches and makes me pukey! Do you know if the Ice Mountain kind uses it? I love the point about impromptu feel good moments!